Tonight and next Thursday, August 24, at the Malco Paradiso, Doctor Who gets skewered. The longest running sci fi TV series in the world—indeed, one of the longest running TV series anywhere—is Doctor Who. It originally ran from 1963 (its premiere was interrupted by BBC’s reporting on the assassination of President Kennedy) to 1989, and was then revived in 2005. You don’t run that long without making some changes, and one of the things that makes the character of the Doctor so compelling is that he always changing. When Time Lords are injured or old, they regenerate into a new body—a device thought up by the producers to keep the show fresh and allow them to do periodic reboots. Originally, the Doctor was allowed twelve regenerations, but that rule seems to be no longer operative, because the show’s fans were just energized to learn that the thirteenth actor playing the Doctor will be Jodi Whittaker, the first woman ever to take up the Sonic Screwdriver. One of the cardinal rules of Doctor Who-style time travel is that you can’t meet yourself. But, like everything else in sci fi fantasy, that rule is subject to change. In 1983, the show celebrated its twentieth anniversary by bringing together all of the actors who had ever played the role for one giant adventure. 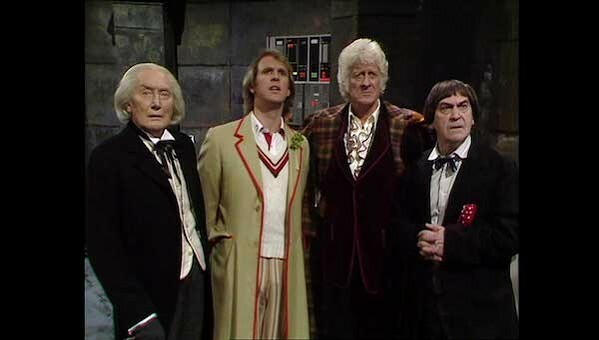 But the show, known as “The Five Doctors”, was famously a giant trainwreck. First of all, the best and longest-running Doctor, Tom Baker, nursing hurt feelings over being forced out of the role two years earlier, declined to appear. Instead, the producers cut in scenes filmed from an unaired Tom Baker episode called “Shada”. So really it was kind of the Four-And-A-Half Doctors. William Hartnell, who originated the role, died seven years earlier, and was replaced by a lookalike named Richard Hurndall, which makes it Three Doctors Plus A Ringer And A Half Doctor. Even though the show was in the midst of a period when it had some of the strongest writing ever (“The Caves of Androzani”, which a recent fan poll named the show’s greatest episode, appeared the next year. ), the highly hyped “The Five Doctors” crashed and burned.